Fashion by Zoidberg ← You Want Me To Wear What? I have a massive backlog of clothes that need posts, so I’ve been trying to weed through them and throw out the ones that don’t quite make the cut. I almost let this vest slide. And then I saw the back. 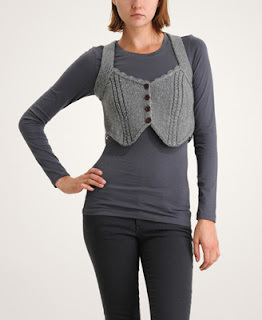 It reminds me of a dog harness mixed with Dr. Zoidberg’s mouth tentacles. 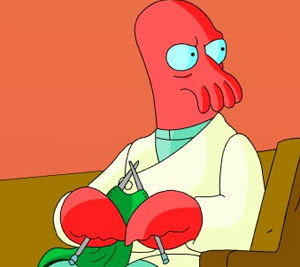 So, basically, if Dr. Zoidberg were to knit his likeness into a doggy harness. Hm. Not such a far-fetched idea after all.